It’s officially a color explosion! I cannot get enough of bright hues and fun patterns and this outfit is a perfect example of that. The Springtime is the best time of year to go all in on color and I am doing just that. Although my style is for the most part pretty traditional, I like to step outside the box from time to time. After all, fashion should be exciting and a form of self-expression. It’s a glimpse into who you are as a person and for me I think shows my inner confidence. There’s no blending in with this outfit and that is just how it was intended to be. You may be surprised to know that this whole look is from eBay! Yes, you heard me right. eBay is a fashion and style playground with brand-name and trendy items all at great prices. They have such a wide range of clothing with options for any size, any style and any occasion. The best part is that their inventory is so robust that you can go back again and again and always find something new. Did you know that 81% of all merchandise sold on eBay is new?! That means that you are getting quality pieces that are accessible to all. eBay also has a money back guarantee, guaranteed delivery and a price match guarantee so you can rest assured that you are getting the best deals out there. Speaking of deals, you can get a glimpse into current promotions on eBay found here. There you will find so many great items site-wide at great price points. 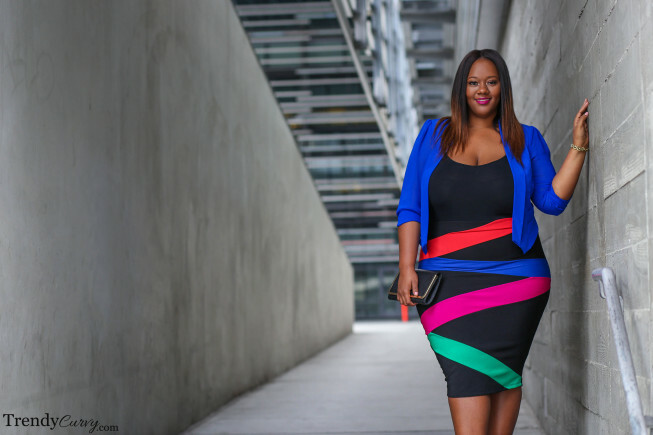 My favorite part of the site though is Curvy Fashion pages. I can get lost for hours scrolling through pages and pages of amazing garments. Everything from Boohoo tops to Forever 21 jackets and dresses to Eloquii pants. See below for some of my favorite items that are available right now! Inspiration in abundance, you have the best style and do color so well. Vibrant is an understatement, you look so radiant & gorgeous in these colors. So great!! Thanks so much! Since this outfit was bought from eBay, it is sold from individual sellers and therefore there’s only one of each. The skirt is from Forever 21 and the jacket is from City Chic but I’m pretty sure they are older items since they were resold on eBay. Sorry! This is beautiful, this is beautiful! The colors, the fit. Kristine, this year I do not know how much more I will be able to take. You have taken off running and you are not slowing down. Thank you so much Judy! What an amazing compliment!